New show at American Steel celebrates the beautiful and the depraved. Detail of Cheyenne Pallo's "Because the Canary Died." The name "Belly" has its genesis in a painting by local artist Cheyenne Pallo. Pallo said she began the painting after meeting a woman with a rather impressive life story — well, birth story. "Her mother decided to have her because the canary died," Pallo explained. "That decision ... is haunting to me." 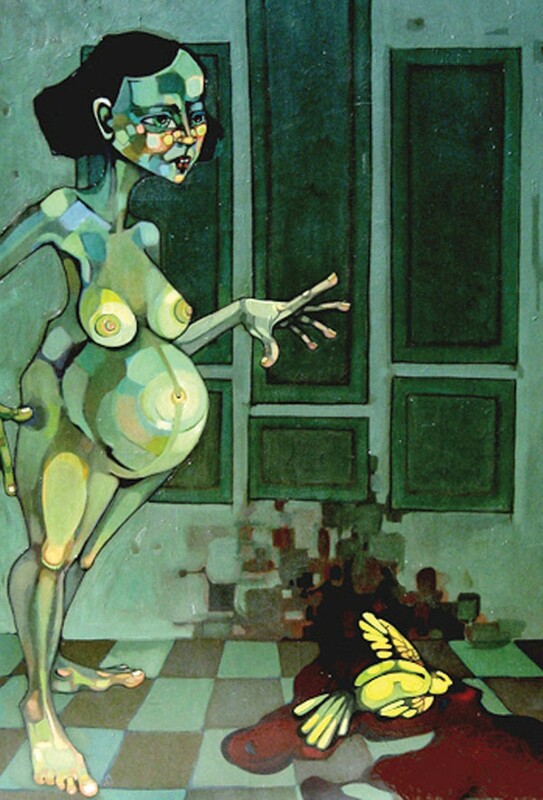 In response, she created a seven-foot painting of a pregnant woman with a dead canary at her feet and called it "Because the Canary Died." 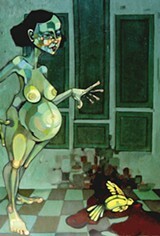 The woman is blue-green with geometric features and a prism of color on her face. The canary is bright, electric yellow against a dark linoleum floor. The painting is a slight departure for Pallo, who often works with found photos and tries to capture a fully rounded character at a single moment in time. Lately she's been getting into large-scale, narrative paintings. "My stuff is getting more and more grand," she said, referring to both the size of her work and the severity of its themes. She now features bellies as a recurring motif. Indeed, "belly" can be a loaded term, partly because it conjures images of our most primal biological functions — conception, digestion, pregnancy, regurgitation. (We'll overlook the inward distinction between a stomach and a uterus.) "A stomach holds all our grotesque parts, but on the outside, everyone's drawn to its loveliness," said Pallo. "It's beautiful, but god knows what's in there." As a painter, Pallo is drawn to things that mix crudeness with surface luster.